In 2012, the Taliban, who had been defeated by the US invasion of Afghanistan after 9/11, sought to open an office in Doha, Qatar. They were open to negotiations with the US after years of war. "We assure you we will not compromise our jihad's main goal of forcing the US to leave Afghanistan," they told Newsweek. Today, the US appears to be on the verge of a deal with the Taliban that may let Washington leave Afghanistan after 18 years of war without the US admitting defeat. 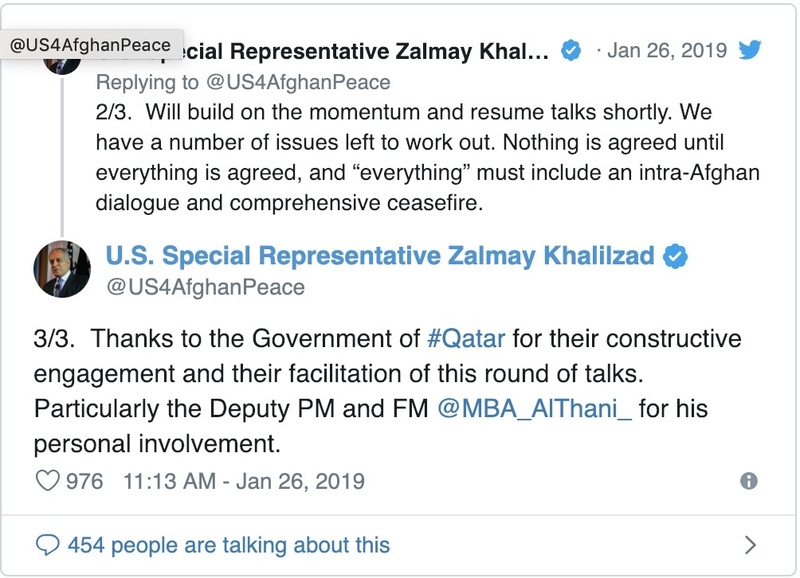 US Special Representative Zalmay Khalilzad tweeted on Saturday that meetings in Doha had been "more productive than they have been in the past." Significant progress was made. "Thanks to the government of Qatar for their constructive engagement and their facilitation of this round of talks," he said. He thanked the deputy prime minister and foreign minister of Qatar. Khalilzad was appointed Special Representative for Afghanistan Reconciliation in September by the Trump administration. He had been the US Ambassador to Afghanistan from 2003 to 2005. It would have been unthinkable back then for the US to be talking to the Taliban. Trump considered withdrawing from Afghanistan after he was elected. In August 2017, he was convinced by his generals to soldier on in the country, where more than 2,000 American soldiers have been killed. In 2017, there were 12,000 NATO troops, including 8,000 US forces in the country, even though combat operations were supposed to have ended in 2014. Afghanistan security forces have lost 45,000 men since 2014, according to a BBC report on January 25. Afghan President Ashraf Ghani is hard pressed today as the Taliban and other threats such as ISIS appear to grow. Trump mocked the complexities of the conflict in Afghanistan in the first days of January, saying he had been shown evidence of the Taliban fighting ISIS and wondered why the US should be in the middle of it all. Qatar, which poses as a broker of the new peace talks, enabled the Taliban to open an office in Doha in 2013. The Taliban held secret discussions in Norway to pave the way to open their office in Doha, according to Reuters. According to a BBC report, the Taliban had 20 representatives in the Qatari city. "For years, the Afghan government and its Western backers were trying to contact the Taliban who didn't have a known address," the report said. The Taliban said they considered Qatar a "neutral" place to meet, an odd assertion considering Qatar is supposed to be a US ally and hosts a large US military base at Al-Udeid. The office opened as the Obama administration was planning to end combat operations. But at the same time, the Taliban said that "jihad" would be used to remove the US from Afghanistan. Leaked US diplomatic cables document how the latest US talks come after more than a decade in which the US hoped the Taliban might moderate. In 2005, intelligence showed that 163 "mid-level Taliban leaders" had indicated they were "ready for conciliation." US had concerns about Qatar and its relationship with the Taliban going back over a decade. In 2006, Assistant Secretary of State for Near Eastern Affairs David Welch met Sheikh Tamim bin Hamad al-Thani and Hamid bin Jassim al-Thani. Jassim said that he was concerned about countries becoming a haven for terrorists and he mentioned the role of the Taliban in Afghanistan. Later in 2009, Jassim met Welch's successor, Jeffrey Feltman in Washington. The US said it wanted to work closely with Qatar on "enacting policies and programs that deter financial flows to Hamas and the Taliban." This would appear to indicate there were problems with terror finance via Doha to the Taliban. A December 2009 cable notes that "Qatar has adopted a largely passive approach to cooperating with the US against terrorist financing." The report notes that "Qatar's overall level of CT [Counter terror] cooperation with the US is considered the worst in the region. Al-Qaeda, the Taliban, UN-1267 listed LeT [Lashkar e-Taiba] and other terrorist groups exploit Qatar as a fundraising locale." Qatar had been hesitant to act against known terrorists out of concern "for appearing to be aligned with the US and provoking reprisals," the US report for the Illicit Finance Task Force noted. The report was part of Special Representative Richard Holbrooke's mission for the Obama administration. Qatar's role in the discussions between the US and Taliban now give Doha more weight in Washington's policies. In 2017, Saudi Arabia, the UAE and Bahrain broke relations with Qatar leading to a crisis in the Gulf. Since then, Qatar has struggled to find more support in the US among Trump administration members who appeared more sympathetic to Saudi Arabia. Providing a way for the US to leave Afghanistan peacefully and not appear defeated after a long war is one way to do that. Back in 2007, Qatar had been critical of NATO using Qatar for operations in Afghanistan. According to a 2007 cable, Qatar had even expressed concern that NATO using Qatar "left Qatar vulnerable to retaliation by al-Qaeda or the Taliban." However, Qatar signed an agreement to support Operation Resolute Support in Afghanistan in July 2018 and says it contributed $1.8 billion to expand CENTCOM headquarters at Al-Udeid to "further strengthen US and NATO capacity in their missions in Afghanistan and the wider region," according to a website of the Qatar America Institute. The US now seeks to find a way out of the Afghan war. Reports indicate that since 2013, the US has backed the concept of talks in Qatar. Trump and Ghani have sought to close the offices of the Taliban in Qatar in 2017. Kabul kept pressuring Doha through the spring of 2018. Instead, the office remained open and Al Jazeera reported that in October 2018, five former Taliban commanders who had once been held at Guantanamo became political officers at the Taliban office in Qatar. They had been released in 2014 during the exchange for US soldier Bowe Bergdahl, the report noted. This was an attempt to close the office before the 2018 spring offensive in which the Taliban would dismiss the idea of new peace talks. 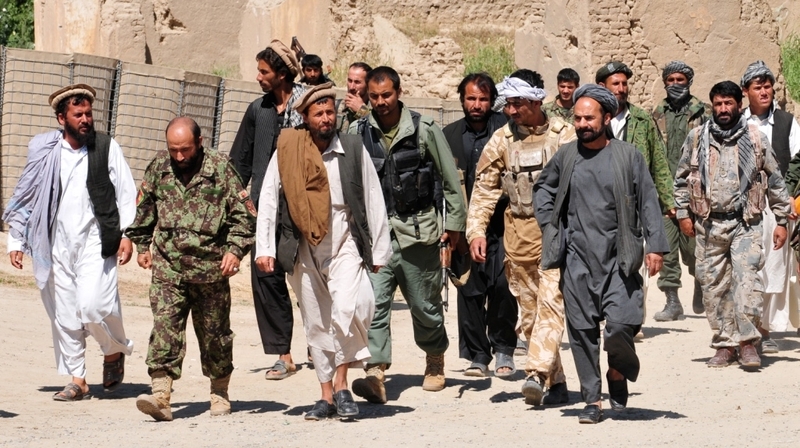 The Taliban struck the city of Ghazni and carried out assassinations in Kandahar in the summer and fall. The Taliban killed more than 100 security forces in January attacks. In the bizarre world that has become the Afghan war, the US may now be asking men it once held at Guantanamo, men who reportedly were close to Osama bin Laden and accused of massacres, to sign a peace agreement. Given the Taliban successes last year and continued brutality against Afghanistan's government, it doesn't appear that a peace agreement will end the fighting, even if it ends the US role.